HAWAII ISLAND - Tropical Storm or Hurricane Watches may be required for portions of the Hawaiian Islands later today or tonight, the Central Pacific Hurricane Center says. (BIVN) – Hurricane Olivia, located 735 miles east of Hilo, is moving toward the west near 16 mph. 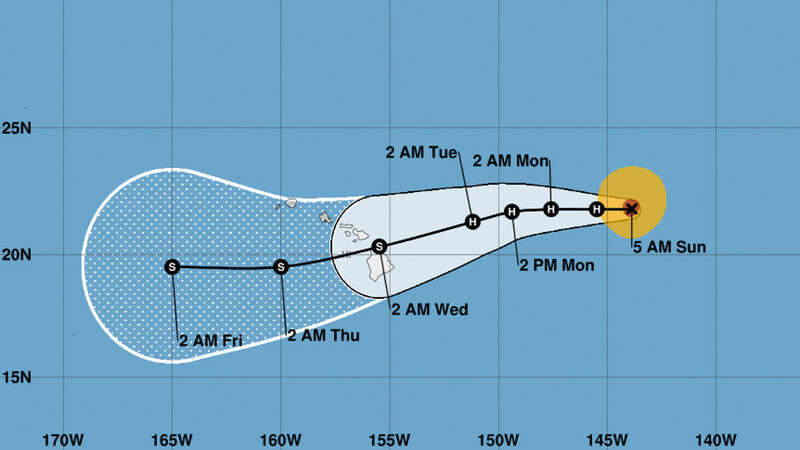 Olivia is expected to continue moving westward, but at a slightly slower forward speed through early Monday, the Central Pacific Hurricane Center says. “All interests in Hawaii should closely monitor the progress of Olivia, and use this time to enact your hurricane action plan. 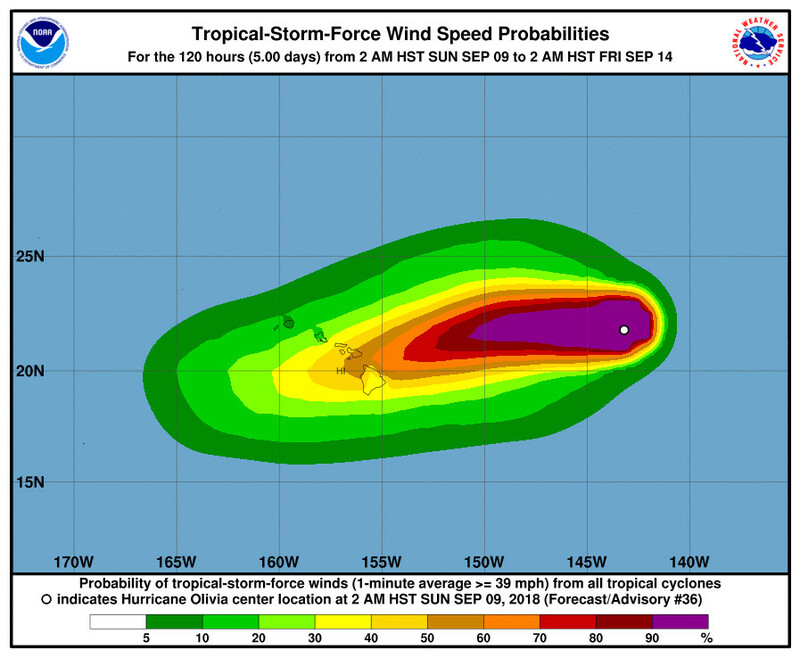 Tropical Storm or Hurricane Watches may be required for portions of the Hawaiian Islands later today or tonight,” the Central Pacific Hurricane Center says. Olivia remains poorly organized early this morning. There continue to be hints of an eye in satellite imagery, but the feature has not been consistent for any length of time. A timely AMSR microwave image from 1140z confirms the initial location used for this advisory, plus it showed a closed eyewall structure a few hours ago. The latest subjective Dvorak current intensity estimates from the satellite fix agencies ranged from 4.0/65 kt at PHFO to 3.5/55 kt at SAB and JTWC. The latest UW-CIMSS ADT estimate is also 3.5/55 kt. The U.S. Air Force Reserves 53rd Weather Reconnaissance Squadron will be conducting missions in and around Olivia later today. The first mission, which will depart from Oahu shortly, will be making direct measurements in Olivia. This will help us determine the track, intensity, and size of the system. The second mission by the 53rd will sample the environment around Olivia to provide valuable data for improved initialization of the forecast models that will run later today. This is expected to improve the track and intensity forecasts as Olivia approaches the Hawaiian Islands this week. Since there is so much uncertainty for the moment in the initial intensity, we will only weaken Olivia to a 65 kt hurricane for this advisory. Olivia continues to move due west, and the initial motion estimate is 270/14 kt. The hurricane is being steered to the south of a strong deep layer ridge situated north through west of the system. 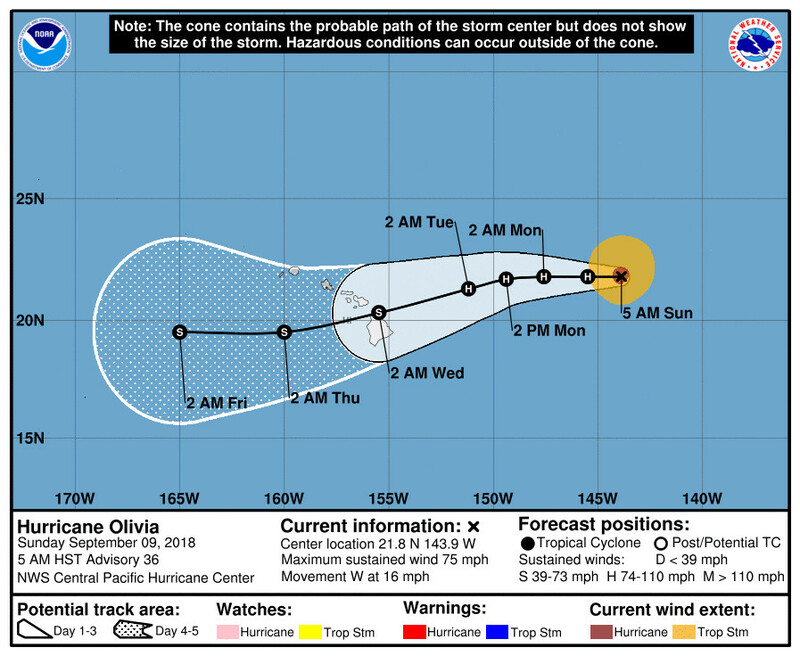 Olivia is expected to continue moving westward at a slightly slower forward speed during the next 36 hours, since the ridging is forecast to build westward in tandem with the tropical cyclone’s movement. Beyond 36 hours, the portion of the ridge to the west of Olivia is forecast to build, which will likely shunt the tropical cyclone on a more west-southwest motion. The track guidance remains fairly tightly clustered, but has started to shift southward. As a result, the latest forecast track has been nudged to the left from days 2 through 4. This track still brings the center of Olivia across the main Hawaiian Islands between 72 and 96 hours. A more westward motion is expected to resume after Olivia’s passage through the islands, as the upper ridge retreats westward and the circulation center becomes increasingly steered by the low-level trade wind flow. Olivia remains in an environment with relatively weak vertical wind shear, but it is moving over marginal sea surface temperatures (SSTs) of 25.5C. The hurricane has likely already traversed the coolest water along its track. Note that the Ocean Heat Content (OHC) analysis from CIRA shows this parameter may increase starting around 24 or 36 hours, so this may help Olivia maintain its intensity longer than is currently forecast. However, vertical wind shear is expected to begin increasing after 48 hours, which will likely result in a gradual weakening trend. Despite this trend, Olivia is forecast to remain a strong tropical storm during 72 to 96 hours, which could cause significant impacts in the main Hawaiian Islands. The latest intensity forecast closely follows the previous advisory. 1. It is important to recognize that errors in both forecast track and intensity, particularly at longer time ranges, can be large. While it is too soon to determine the location and magnitude of the worst impacts, all interests in Hawaii should continue to monitor the progress of Olivia, and use this time to prepare for the increasing likelihood of direct impacts from this system this week. 2. Regardless of the exact track and intensity that Olivia takes as it approaches the islands, significant effects often extend far from the center. In particular, the mountainous terrain of Hawaii can produce localized areas of strongly enhanced winds and rainfall, even well away from the tropical cyclone center.